Things are getting interesting around the ol' Hot Stove. The Yankees and Derek Jeter are looking at each other funny. The Yankees are suddenly acting like cheapskates when it comes to the Captain. He deserves every penny he's asking for for being one of the few superstar players that did not let us down during the steroid era. He had a down 2010 season but he isn't done just yet. The Yankees may want to phase Jeter away from shortstop, and that's understandable, but they should not force Jeter to play for the Baltimore Orioles. The popularity hit they would take is a lot bigger than they seem to think. Someone is flooding the internet with rumors of Zack Greinke and the Yankees being a better match than most have speculated. Greinke has suffered from anxiety and bouts of depression. Most think that the pressure of New York would be too much for him. I submit that the man was depressed playing for the Kansas City Royals, who wouldn't be? The Yankees are about as far from the Royals as an organization as you can get. Plus, the Yankees clubhouse is very protective of their younger players and Greinke would get a ton of support. That said, I still don't buy him coming to New York. What is Adrian Beltre looking for? He turned down $64 million from the Athletics. For certain, the Athletics are not the ideal team for Beltre but other than re-signing with the Red Sox (still a possibility) teams like the Angels and Orioles seem like bad fits as well. The Rangers would be nice but are they really looking to add an expensive third baseman with Michael Young on the roster? The Giants are hoping they don't need to shop for a third baseman. Pablo Sandoval in an effort to re-gain the starting position he lost in the playoffs has begun a rigorous off-season program to lose weight and get in better shape. He has hooked up with Triple Threat Performance, the experts that are famous for working with major leaguers like Barry Bonds, Alex Rodriguez and Gary Sheffield. Hey! 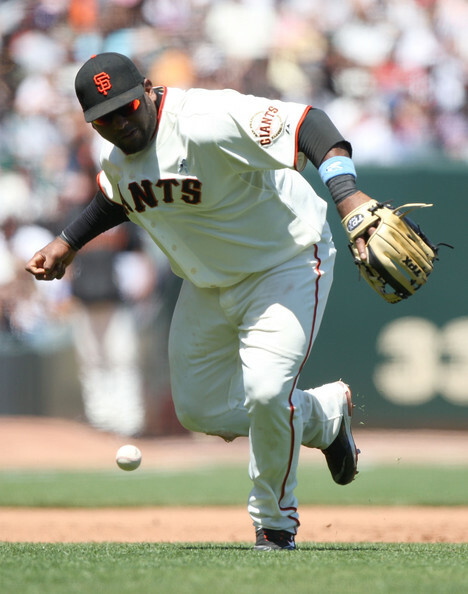 No steroid jokes about Kung-Fu Panda. The Los Angeles Dodgers signed free agent infielder Juan Uribe. The strangest thing about this signing is the report that Juan Uribe turned down essentially the same three-year, $21 million offer to stay with the World Series Champion, San Francisco Giants. The Dodgers plan to start Uribe at second base and to emphasize that plan they traded away infielder Ryan Theriot. It is not official yet, the Giants wasted no time signing Miguel Tejada to a one-year contract to be their starting shortstop in 2011. However, the Giants are supposedly still interested in acquiring Tampa Bay shortstop Jason Bartlett. Uribe posted a career high walk rate and hit a career high 24 homers in 575 at-bats. Uribe has nice power for a shortstop. Although his BABIP was very low at .256 (career .282) fantasy owners should not expect much of a rebound in batting average. Uribe has a swing at everything approach that doesn't jive with his mediocre contact rates. He should continue to provide pretty much the same stats as a Dodger. Dodger Stadium is slightly better for homeruns but suppresses scoring at a rate similar to AT&T Park. I find it interesting that the Dodgers have been fairly aggressive to start the off season. I guess I assumed that the divorce would be an impediment to progress. The Dodgers are one of the teams I want to root for to do well. Unfortunately they have lousy ownership and a GM in Ned Colletti that hasn't convinced me he knows what he's doing so far. So far so good for 2011. Texas Rangers signed Japanese free agent right-hander, Yoshinori Tateyam. The Rangers have signed Yoshinori Tateyam to a split contract that means he will be paid differently depending on whether or not he makes the major league club. Tateyam features a fastball that sits around 90 mph, a screwball that he features against left-handed batters and excellent control. He apparently has a very deceptive delivery that should at least make him effective the first time around the American League, assuming he makes the team. He isn't a threat to steal the closer job at this point so his fantasy value should be minimal. The Los Angeles Dodgers traded middle infielder Ryan Theriot to the St. Louis Cardinals for right-handed reliever, Blake Hawksworth. The 2010 season was not a good one for Ryan Theriot. He pretty much had his worst season as a professional. He will play the 2011 season at age 31, so it isn't too hard to envision a bounce-back season. The Cardinals are apparently planning to move him back to shortstop, where Theriot claims he is more comfortable. What that means for the light-hitting Brendan Ryan is still a question to be answered. Theriot usually provides a decent on-base percentage. His walk rate has been all over the place but his career 8.4 percent walk rate is probably about right for projecting. He has a good eye at the plate and a strong contact rate complemented by his above average speed on the bases. If his BABIP once again approaches his career level, Theriot should be able to hit for a batting average in the .275-.285 level and steal at least 20 bases. As a shortstop he has more fantasy value than some might expect. Blake Hawksworth is a typical right-handed reliever. He had a very unfortunate 2010 season, but has the potential to be a solid middle reliever. His fantasy value should be minimal. Texas Rangers signed free agent C Yorvit Torrealba. Atlanta Braves signed free agent C Wilkin Castillo. Pittsburgh Pirates outrighted Andy LaRoche to Indianapolis Indians. LF Wilkin Ramirez assigned to Atlanta Braves. St. Louis Cardinals signed free agent LHP Brian Tallet. Pittsburgh Pirates signed free agent RHP Fernando Nieve. Pittsburgh Pirates signed free agent 3B Andy Marte. Pittsburgh Pirates signed free agent C Dusty Brown. Jeter deserves every penny he's asking for? Really? Since when do shortstops who have little power and bad defense deserve 22 mil per year? How much would you pay Jason Bartlett? 30 mil per year? This is the first time I've come across this blog, and I must say I love it. Like the quick snippets in this post about the transactions. About Derek Jeter, I do hear what some people are saying about how much Jeter has done for the Yankees and how important he is to the franchise. But that aside, he really does not deserve what he is asking, and I'd be hard pressed to admit he deserves 15M/Year for 4 years. The fact of the matter is is that he did great things for the franchise, and he has already been paid for that. He shouldn't be "rewarded" for his successes on the Yankees because that came from his contracts & bonuses of the past. It's decisions like the ones saying pay him what he wants that gets baseball criticized for making such bad moves. This is a business, and the Yankees should be making wise business decisions. And Jeter leaving won't be as big a PR nightmare as is being talked. Why? Because he's still just one guy on a team, on a franchise that has had epic success before him and will have just as much after he is gone - the fans aren't going to suddenly buy Mets hats because Jeter left. Hopefully, the Yankees stick to their guns and prove me right. I think they will, too. The market for Jeter is really one team wide at this point, and so they will meet somewhere that makes more business sense overall. Hey Guys, thanks for reading and commenting. I appreciate the nice words and the conversation. I guess i should have qualified that statement a little better. I don't think Jeter has EARNED more money than he's already been paid. He has obviously been paid quite well for what he has already done. The three-year/$45 million is probably a great contract for him considering his likely value from this point forward, though it might be a bit of a bargain if he bounces back to previous levels. I think we tend to over value the previous season a bit too much. That said, it is also undeniable that Derek Jeter and the resurgence the Yankees experienced around his time with the Yankees has propelled the franchise to greater heights than any club has ever experienced. No, Jeter isn't solely responsible for that. But his story, his legacy is extremely important to the Yankees, and they do want him around when he notches 3000 hits (no Yankee has that mark, isn't that crazy) and if he can bounce back and remain around a 3.0 - 4.0 WAR player, he has a shot at 4000 hits if he gets to the play the five more years he wants to play. I don't think he expects to remain a shortstop that long but considering his history it isn't that far fetched that his bat remains viable. Nothing on Javy Vazquez? Think he can find his form in pitcher-friendly Florida? Hey Pauly, I usually wait until the contracts have been signed to write about the transaction, which is why my Benoit piece seemed late. I do like the move for the Marlins. I think back in the National League, Vazquez should rebound some. I doubt he'll be the pitcher he was in 2009 with the Braves but still a better than average pitcher. I think he hate pitching in the American League and especially in New York City.